This is the first article in a short series on how to sell ebooks using longtail marketing strategies. In this article I talk about how to build a customer base on Twitter that you can use as part of your Longtail Marketing Strategy. When it comes to marketing I’m no expert, but I’ve been doing it for a little while now and although my books are not selling in huge volumes they are selling at a steady trickle, so in the next couple of articles I’m going to explain my book marketing strategy. I bill myself as a part-time author, because I have a life, a job, children, and other businesses. My dystopian steampunk novel, Gaia’s Brood, is not my first book or the first I have put on sale. It is, however, the first book I have produced on a commercial basis, treating writing like any of my other businesses. I’m going to be totally honest here: sales are steady, but not great – they will pick up after I have added two more novel length books to the series and a free prequel novelette, because that is the nature of internet self-publishing. Don’t go expecting anything big from a single novel, despite what everyone advertises, unless, of course, you are a hidden genius. And certainly don’t part with any sizeable amounts of money because there are a lot of people out there who have discovered it is easier to separate you from your cash, by selling you the self-publishing dream, than it is for them to realize the dream themselves. One thing about self-publishing that really annoys me is the way anyone who has written a short novella and published it online, and many who haven’t even got that far, can set themselves up as a writing/publishing expert and push ebooks on, ‘How I did it.’ I got news for you – unless you are actually making a liveable wage for the sale of novels, you are not living the dream: you are just an entrepreneur selling the dream. This is one reason I give away all my writing advice for free: my dream is to be an actual, commercially successful, author. Self-publishing has been called the next great gold rush, because it is a high stakes game where a are few are wildly successful, but most slog away for virtually no return. And just like any gold rush there are two types of people who succeed in making money from all those deluded prospectors: the honest people who sell shovels, and the charlatans who sell the dream. Wannabe authors can spend a lot of money trying to get rich quick by joining any number of schemes to sell large volumes of books, and it is almost always guaranteed to fail while lining someone else’s pocket. In this small series of articles I outline ways to construct a solid writing business that doesn’t cost the earth. However, I must warn you now, that it take a lot of hard work. If you would prefer to follow the dream of selling large volumes of your one and only book, stop reading now, because I can offer you no real advice except to first read this article by Derek Haines on book promotion and placing. On the other hand, if you want to discover how real self publishing works, read on. Paid for marketing does sell books, but the amount of money you need to spend on publishing is loosely proportional to the quality of the book. Of course, if you are that one in a million genius, you still won’t have to spend much money, because viral publicity will do the job for you. So how do the other 299,999 pulp fiction writers, like me, with fun, but average books/stories do effective marketing? (I am ignoring the 250,00 writers who never finish their first book and the 475,000 who only ever write one, because no amount of marketing will magically create a writing career – only sustained hard work will do that – sorry, the hype is lies, hope you haven’t spent too much). Market slow; write fast; target a specific audience.Tweet this! Nothing sells books to readers like more fun books in the same series, so the most effective and cost-effective method of selling books is to write more. As far as I am concerned, anything that detracts from the sacred writing time is bad business, and that includes marketing. I may be just a skinflint, but it seems to me that instead of spending my writing profits, however small, on short-term marketing, I should be investing them long-term on producing a high quality next book (hiring editors, cover designers, etc). I’m not very consistent at marketing. Having a busy life and writing schedule, my marketing tends to appear in short patchy bursts as-and-when I can fit it in. This means, ideally, that my marketing efforts must be self-replicating and sustain themselves. Whatever marketing I do must be manageable within the context of the rest of my life – yes, writing is a business, but also a lifestyle choice. I need to know there is a steady marketing base chipping away in the background ready to support whatever short-term promotions I choose to trigger as-and-when I get the opportunity/time. I draw a lot of marketing inspiration from Derek Murphy. He has a formidable work ethic, but he is also a gifted copy writer, running a business, and has at least ten employees in the background, not to mention other freelancers, helping him churn stuff out, so take what he says with a ‘healthy pinch of salt’. What he does is incredible and he is very successful. However, for him life is business, but that is not me and not my life. I cannot possibly emulate him, so I try to use some of Derek’s marketing techniques, within the framework of my life, in a low impact way. Here’s one thing I have learned from Derek about selling on the internet, which is illustrated by this graph: the internet (specifically social networking) is the perfect tool for targeting niche markets. So if you want to self-publish successfully, make sure your novels are aimed at a niche audience. The key to self-publishing success is finding a niche market.Tweet this! I failed to learn this lesson with my first books, The Helium3 Series. The audience were too generic, which meant my marketing efforts were swamped by a sea of other generic marketing. My current books, Gaia’s Brood and Cogler’s Brood are aimed squarely at the Steampunk niche. Market your books on whichever social networks your target audience use.Tweet this! Wait! You mean I need a target audience? But I write for everyone. If you truly have a good, well written book that will engage a generic audience, don’t self-publish. Novels with generic appeal are exactly what the publishing industry are looking for. However, if you are self-publishing, a target audience will certainly help narrow your aim when it comes to marketing. Yes, you may need to edit your manuscript again to make it fit a specific genre or niche, but it will be worth the extra effort in the end. 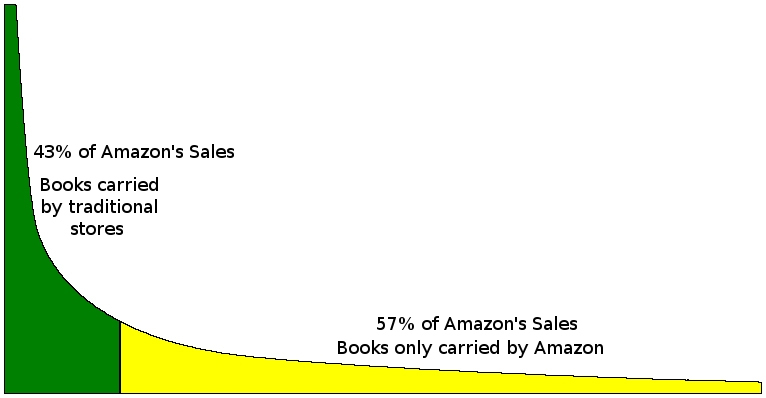 Remember, Amazon still make the majority of their publishing profits from specialist books – niche markets. The internet is a brilliant tool for selling to niche markets.Tweet this! There are plenty of comparison sites out there to inform you who uses what social networks. So do some research, but keep one thing in mind: you are looking for a marketing tool for your business, not a network that will win you a personal popularity contest. In fact, I would strongly recommend you separate your writing accounts from your personal accounts. I use a pen name, but if you have already published under your own name it will be too late for that, so maybe you can set up accounts under the book / series / character name instead. I use only two social networks, which is about as much as I can manage. These are Twitter and Wattpad, and there are good reasons why I use both: I find my dystopian steampunk stories have two natural audiences: a young adult audience, looking for dystopian fiction, and a more mature 30+ audience looking specifically for steampunk. My two audiences tend to use different social media: young adult readers are almost certainly on Facebook or snapchat, but are also often found on Wattpad, and the more mature readers are often found on Twitter. Both audiences almost certainly use other social media too, but I find I am most comfortable with these two networks for my commercial activities. Interestingly, both audiences are mutually exclusive: very few of my followers have accounts in the other network. Both networks require different techniques to achieve similar goals. Twitter is the network into which I put the main effort. After some experimentation, I have worked out how to use these networks effectively and in a way that fits with the rest of my life. The lifestyle fit is important to me if the marketing effort is to be sustainable: low impact, scalable. The first thing for an author to learn about Twitter is this: it’s useless for selling books. The second is that Twitter is transactional in nature: You share something for someone and they will share something for you – good old western style capitalism. Sending out a stream of tweets saying “Buy my book. Buy my book,” is like hitting your head against a brick wall unless you are offering something in return. However, Twitter is brilliant at driving traffic to a website (95% of all traffic to my website is via Twitter), and you don’t even have to worry about search engine rankings for your website and Search Engine Optimization (SEO) provided you research your keywords and are offering quality content that you contacts want to read. I will share lots more about Twitter in later articles in this series. Wattpad has virtually no transactional element – it is true social networking. To get anywhere on Wattpad you need to build proper relationships. Compared to the thousands of followers I have on Twitter, I have maybe a hundred active followers on Wattpad. So why bother? I can answer that in one word: fans. One hundred real fans of my work are worth much more to me than ten thousand followers. Fans keep returning, fans write favorable reviews, fans spread the word, fans not only buy this book, they buy the next and the next. Fans are worth their weight in gold, so look after them. Wattpad is typically populated by youngsters who are keen on writing and super keen on reading. Read their work – many are sharing something publicly for the very first time – give loads of positive feedback and encouragement. A word of encouragement and advice from someone they consider to be a ‘pro’ means a huge amount to youngsters just setting out on their writing journey. Help them, build a relationship with them, and they will be your fan for life. They may not buy your book now, but give it a few years and they will be your best customers. One word of warning about Wattpad: some of the stuff you will read there is so traumatic it can only be the result of personal experience. So tread carefully, be positive, confine your words to writing advice, and treat everyone with respect. I cannot emphasis enough, that as a writer you need to find your genre, find your niche, find your audience. In terms of self-publishing, the more specific your niche the better. Then find the social networks where that audience hang out. This takes research, lots of research, and maybe some experimentation, and maybe a re-write of your work, but it is worth it. In the next article in this series, I will explore suitable website content for longtail book marketing, before returning to the use of twitter in conjunction with a website.